Note the projectiles in flight on the right. As a complete analysis of the material in the Reports on Gunnery Exercises will take many years, perhaps decades, to accomplish, this paper might therefore be best characterized as an interim report, analyzing in some detail - and confining itself to - the sections dealing with battleship main and secondary battery gunnery between 1920 and 1945. For the first forty years of the century the battleship's guns were considered the ultimate weapons of seapower. Not surprisingly, testing and evaluating their gunnery was considered a high priority, and the U.S. Navy, like most of its rivals, conducted gunnery practices at least once a year. The specific rules under which any given exercise was to be fired were promulgated in various editions of the Orders For Gunnery Exercises, which, amongst other things, contained the arcane and somewhat arbitrary formulas from which the ship's "gunnery merit" could be computed. These mathematically computed merits were used to rank the various ships in the fleet, to award prize money and trophies to the winners, and sometimes to censure the losers. Their application seems to have been always controversial, and the system was several times deleted only to be reinstated again. Two computations were normally done. Each ship was granted a regular merit score derived from computations given in the rules. In addition, to its regular merit every battleship was assigned a "graded merit" which was determined by giving the best ship a score of 100%, and factoring the others down from that. The result of real or perceived inequities in the rules generated a good deal of sometimes not-so-good-natured complaining, especially from the crews of the fourteen-inch gunned ships who could not realistically compete one-on-one with their sixteen-inch gunned sisters, and who thus had little chance of winning a prize. In response, the CNO once investigated (and subsequently rejected) a handicap system, although the rules were eventually modified to reflect the inherently greater dispersion of the smaller gun. The entire merit system finally died out shortly before the beginning of the war. The schedule of gunnery exercises to be fired in any given year was selected from a master list according to the priorities of the time, Policy dictated that every active ship in the fleet participate in at least some basic gunnery exercises every year. Long Range Battle Practices, Short Range Battle Practices, Night Battle Practices, and Anti-Aircraft Practices were fired annually. Experimental Practice - usually designed to explore technical questions such as the ability of new directors to keep on target during radical turn - were fired every couple of years. Advanced Day Battle Practices, often involving evolutions such as firing in indirect mode (through smoke screens) were fired less often. Prior to 1931 the battleships fired torpedo practices as well. Candid commentary in these Confidential documents was by no means restricted to junior officers. Admirals and even CNO would occasionally take up an issue as well. In 1937, for example, Admiral Simons, then Commander Battleship Division One, would write of Night Battle Practice, Secondary Battery: ". . . night firing requires common sense and constant drill in estimation of ranges of objects under illumination. I mention this because in some instances common sense was not used." ". . . it soon became apparent," he continued, warming to the topic, "that a nebulous doctrine guided procedure [which sometimes resulted in a] senseless waste of ammunition coupled with an unreasonably long time before the target was hit." For most of those in the fleet the major incentive for good gunnery lay not in the chance to make admiral, but in the opportunity to win a monetary prize, either in the form of a monthly bonus, or a lump-sum payment. Such awards could, in some cases, be fairly generous.5 Ships were, for whatever reasons, not above bending the rules or exploiting loopholes in the complex scoring system in order to gain an advantage. In one classic example, a battleship avoided a rule which prohibited taking ranges on the target sled before "open fire" by ranging on the towing tug instead, and shifting deflection at the appropriate time. Long and consistent observation revealed that large errors in range were more common than large errors in deflection, and much more difficult to detect. At short ranges, especially with high velocity guns, the outline of the towing tug could actually intersect the nominal trajectory. This, and the danger from ricochets, resulted in safety precautions which precluded the towing of targets at high range rates, i.e., nearly toward or away from the firing ship. The same problems afflicted anti-aircraft gunnery practices as well. Low level nearly head on aerial attack - such as might be conducted by a torpedo bomber - were rough to arrange unless the towline was very, very long. High level bombing attacks could be simulated by using a relatively short towline, but maneuvering the sleeve at the end of such a tow line was entirely impracticable. Simulating dive-bombing (or much later, Kamikaze) attacks was well-nigh impossible, except by using drones. Even this technique was rarely employed; an out-of-control (and very expensive) drone could easily crash the firing ship. The target for most gunnery exercises was a sled towed by another battleship, a tug, or a destroyer. As the figure below shows, a wide variety of targets was employed, the largest being towed on 172-foot long battle rafts. 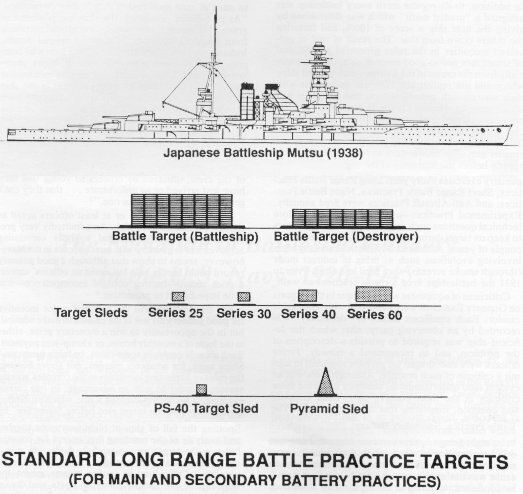 For long range practices, potential targets larger than a light cruiser were represented by a 140 foot by 40 foot "battle rafts" made up of light wood battens (which allowed "overs" to be spotted through the mesh). Destroyers were represented by a 140 x 20 foot screen. For short range practices, a wide variety of "sled" or "high speed" targets were used. 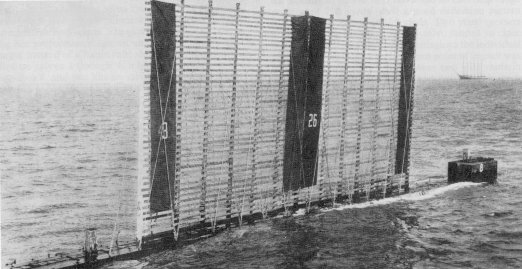 The largest of these, the PSAO, displaced 28 tons, and carried three 25-foot square target screens. The target screen for 5-inch short range practices was typically 15 feet square with a 6 foot bulls-eye at the center; from 3,000 yards, almost every shot was expected to hit the screen. Pyramid targets were used only as drifters. Rarely, live firings were conducted against actual ships. These were hulks if they were to be sunk, grounded wrecks or radio-controlled "mobile targets" if they were not. Destroyers Lamberton and Boggs, and ex-battleship Utah (normally used as a live bombing target) were available in 1940. Firing directly at the mobile targets was generally forbidden - a single heavy caliber hit could easily do extensive and perhaps irreparable damage - and the mobile targets were in practice most often employed as towing ships, especially where the use of a very short towline could permit the simulation of difficult and otherwise potentially dangerous maneuvers. When a towed target was unavailable or inconvenient, offset practices could be fired instead. Regardless of the actual size of the target itself, which often served only as an aiming point, standard scores were often computed - and merits assigned - with reference to a so-called "constructive target," a mathematical entity designed to represent the vulnerable area of a typical target vessel. The constructive target, laid out as an imaginary rectangle on the surface of the ocean, was 564 feet long for battleship or aircraft carrier targets and 258 feet long for destroyers. The width or "beam" of the constructive target rectangle varied with the angle of fall, and was thus dependent upon range and the type of gun firing the exercise.8 Although surface gunnery targets experienced relatively slow evolution, aerial targets varied markedly over time. In 1940, five types were available, the smallest 31 inches in diameter and 19 feet long, the largest 42 inches in diameter and 30 feet long. Main battery fire was controlled by a variety of methods. In local control, both pointing and training were done at the gun. In director fire, training and pointing instructions were sent to the guns from instruments located aloft. In older systems, the guns were laid (and left) at the proper elevation, matched to the director sight in train, and fired from a single key in the director when the roll of the ship brought the sights on the target. The rate of fire was highly dependent upon the period of roll and, if the ship was pitching or the guns were being fired on bearings well forward or aft of the beam, upon the pitch rate as well. Wave movements, or ship maneuvers meant that the hull and the turrets were tilted in various directions over time; the unwanted components of roll and pitch along the line of fire could be removed either by elevating and depressing the guns in synchronism with the roll, a process known as continuous aim, or more commonly by leaving them at fixed elevation and firing when the sight wires crossed the horizon. As the guns were held at fixed elevation, the elevation (and therefore the range) could be and sometimes was slightly increased by firing at the top of the roll. A 20 foot by 60 foot raft on the way to an exercise. They were generally in much poorer condition coming back. Although this photo was probably taken during WWI, this same type of target was employed through to the end of WWII. W. Jurens collection. The component of roll perpendicular to the line of sight, known as cross-roll, required frequent small adjustments of the turret in train and resulted in a phenomena known as trunnion tilt, which although it typically caused only moderate variations in range, resulted in large errors in deflection. A simple solution, though one which (at least at first) required the simultaneous use of two directors instead of one, was to fire in so-called "selective cross roll. "9 In this method, one director was pointed at the horizon 90° to the line of sight, i.e., parallel to the trunnions of the guns, and the other director was pointed at the target. The operator in the target director kept his cross hairs on the horizon, and thus sent a series of continuous corrections to the pointers at the guns. His firing key was closed all the time. The cross-level operator completed the firing circuit when his crosshairs crossed the horizon, i.e., when the trunnion tilt was zero, or some other arbitrarily chosen figure. Achieving simultaneous (salvo) fire was important using either of these systems, as guns firing "early" or "late" would have differing angles of departure, and would thus markedly increase the pattern size, especially if the range was short. Later, directors were modified to combine both level and cross level telescopes in a single installation. Constant elevation and depression of the guns could cause problems as near maximum ranges, as excessive roll could then cause the guns to come up hard - and sometimes jam - against their upper or lower stops.10 None of these optical methods could be used at night, in poor weather, or in any other situation when the directors could not clearly see the horizon. After the storm. Targets often returned from battle practice much the worse for wear. Compare with previous photo. C.C. Wright collection. True continuous aim, which employed gyroscopic "stable verticals" to determine level and cross level without requiring visual observation of the horizon, became available in the mid-to-late 1930s. In smooth seas, this new system was capable of sending corrective signals to the guns on a continuous basis, so that - at least in theory - they always remained correctly oriented in space, and the ship in effect rolled and pitched around the guns.11 Because there was no longer any need to wait for the roll of the ship to bring the sights on the target, continuous aim allowed the guns to fire any time they were ready. Firing the guns at irregular intervals marginally increased the rate of fire at least in theory - but only at the cost of smaller patterns and a considerable loss of spotting efficiency. Many of the older battleships were equipped with guns in single slides, i.e., with all the guns of a turret attached to a single elevating mechanism. This had mechanical advantages only one elevation operator or "pointer" was required to control all the guns in a turret for example - and meant that the guns could be mechanically aligned with each other with great precision, thereby theoretically decreasing the pattern in range, especially when ranges were short and pointing errors dominated. One disadvantage was that the single slide system allowed no way to individually adjust the elevation of the guns to compensate for changes in initial velocity as the guns wore out, which markedly increased the patterns if the range was long. In many older turrets a curious arrangement of the single slide adjustment mechanisms meant that correcting the elevation of a barrel resulted in a decrease in the parallelism of the guns.12 In addition, a single slide installation also reduced the rate of fire of the entire turret to that of its slowest gun crew - everyone had to wait until the last gun to load - and was vulnerable to a single component failures. Loss of the elevating gear, for example, or the incapacitation of the pointer, could put the entire turret out of action. Single slides were abandoned as soon as new design (or redesign) allowed the installation of multiple slides, which allowed each gun to elevate independently. The Navy started experimenting with delay coils - simple mechanisms which prevented adjacent guns from discharging absolutely simultaneously - about 1935. Prior to the installation of delay coils, shells fired in salvo could travel in such a tight formation that they could actually collide, or "kiss" in flight, a phenomena which could be occasionally observed through binoculars. The velocity difference between projectiles traveling in salvo was so small - often less than ten feet per second - that shells fired very slightly late, and perhaps traveling very slightly faster than their counterparts, could spend a considerable amount of time in the confused air stirred up by the leading shells in the group. This increased their drag and made them fall short. An associated problem was that shells were often disturbed by the muzzle blast of an adjacent gun, especially if the muzzles were close together. The resultant wobble also increased the drag. The net result was a considerable number of "wild-shorts," i.e., shells which fell far enough short to be completely out of the pattern.14 Early installations of delay coils, which fired all guns at different times, created problems with turret whip, a problem which was, incidentally, rediscovered in the 1980s when Iowa and her sisters installed similar delays in order to decrease the effects of muzzle blast on pressure-sensitive equipment. Later installations fired both outside guns of a triple turret simultaneously in order to negate, or at least minimize, the effects of whip. The problem was, of course, inherently incurable in twin mounts, which is one reason that it was never used in 5"/38s. Prior to the advent of radar, spotting, i.e., correcting the fall of shot, was done visually, either from directors aloft or from aircraft. Visual spotting, in good hands, is still very effective today, and is often better - at least in deflection - than radar. Accurate visual spotting took keen eyesight, good judgment, and prolonged training. The spotter had to judge the amount each shell was short (or over) by visually estimating the very small distance between the base of the splash and the waterline of the target. This was an almost impossible job if the waterline was below the horizon or if the pattern was off in deflection, so patterns had to be brought on in deflection before accurate range spotting could begin. At short ranges, i.e., under about 15,000 yards, so-called "direct" spotting could be used, with the spotter estimating the error in the impact point straight away. At longer ranges, the "bracket" or "halving" method was common, with the spotter depending upon the "sense" of the splashes to tell if the pattern was short or over, then coaching the pattern "on" by deliberately crossing and recrossing the target until straddles were achieved. Secondary batteries often employed the "ladder" method, deliberately opening short, thereafter firing salvos as quickly as possible at small increments in range until the target had been crossed, then reversing so as to re-cross the target in the opposite direction. A somewhat similar technique was to aim short, fire as rapidly as possible at constant range until the target had passed through the resulting barrage, change the range by some predetermined value, and wait for the target to steam through the patterns again. When air spot was available, the spotters on the ship would use aircraft observations to correct the range, and visual observations from the ship to correct the deflection. If air spot was unavailable, as was normal, the pattern had to be spotted in deflection first. The practice [is to be] fired as a division practice in accordance with the following organizations: West Virginia, Maryland, Colorado, California, Tennessee, New Mexico, Mississippi, Nevada, Arizona, Pennsylvania, Oklahoma, New York, Texas. To train main-battery personnel in firing at long ranges under conditions simulating day battle. To test the ability of battleship to maintain an effective indirect fire after the establishment of the hitting gun range by direct fire. The tactical situation assumes a battleship division in the battle line engaging an opposite enemy capital ship in triple concentration in normal action to starboard. During the firing the enemy ship is obscured by a smoke screen. The firing division maintains fire by indirect methods while executing maneuvers to reduce the effectiveness of the enemy fire. The practice shall be fired as a division practice in which all ships of the division fire simultaneously. In order that there may be reasonable assurance that smoke made by the target screening ship . . . will effectively screen the targets during the firing, it is desirable that the practice be fired when there is a true wind of at least 10 knots. Director fire shall be used. Selective level or cross level may be used. The ammunition allowance for one group of turrets shall be expended before the other group opens fire. The purpose of this provision is to prolong the practice and at the same time afford each turret the training incident to firing at least 10 consecutive salvos. The battery shall be loaded as directed by the division commander. The firing division's own aircraft and personnel may be used for furnishing observations of the course and speed of the targets and for observing and reporting the fall of shot throughout the practice, provided that such aircraft shall not approach closer than 5000 yards. The gun range at which fire is opened should be 17,000 yards or greater if visibility permits and not be less than 14,000 yards. During the approach the Mk XXXIV range finder shall be used by the firing division's own aircraft, and radio or visual bearings of these aircraft shall be taken. Fire shall not be opened until the ranges and bearings thus obtained have been checked by ranges and bearings taken from the firing ships. Quite often, the "plain vanilla" practice was spiced up by requiring ships to change from direct to indirect fire part way through the practice, by simulating various equipment failures (typically the failure of a main battery directors or part of the communication system), or by using fall-of-shot observations from planes. Other variations consisted of attempting to complete a turn midway through the shoot, shooting in concentration with other ships, or attempting to use the observations of spotters based on other vessels. Practices were fired with reduced charges (and reduced velocities) in odd numbered years prior to the 1933-34 gunnery year and from 1936-1941. The resultant ranges average about 16,200 yards. The result was equivalent in angle of fall and time of flight to 14-inch full charge practices fired at about 22,000 yards and 16-inch practices fired at 26,000. Improvements in technology rendered World War II battleship gunnery dramatically more effective than that achievable during the twenties and thirties. Four changes were important. First, modifications alter Pearl Harbor saw the 5"/51 and 5"/25 mixed secondary batteries aboard the older U.S. battleships replaced by the ubiquitous (and still remarkably useful) 5"/38. Second, the new South Dakota and Iowa class battleships carried new versions of the 16-inch gun coupled to vastly superior fire control systems. Third, the extensive use of radar, virtually unknown between the wars, completely transformed the surface and aerial fire control problem both in daylight and in darkness. Fourth, the proximity fuze completely revolutionized the effectiveness of anti-aircraft gunnery. The following examples illustrate the performance of typical ships in detail. In each case, the example represents the performance of the median ship in the fleet, so this is average shooting, neither exceptionally good nor bad. As the original "Sheets 4" describing the exercises are nearly illegible, and extremely complex, the accompanying illustrations have been withdrawn to a common scale and considerably simplified to make the results more meaningful to the reader. The actual target used in the exercise, which was often defined mathematically rather than physically, has been replaced by a scale plan view of a typical enemy battleship, in this case a 785 foot (240 meter) vessel traveling in a straight line at 20 knots. Shell splashes are shown as open circles, and probable hits as solid dots. Three examples shall suffice. Despite these problems, Nevada did remarkably well, actually shooting better than Bismarck did seventeen years later in the Denmark Straits under roughly comparable conditions. The plot of the exercise, showing her performance against an 785-foot twenty-knot target instead of a battle raft, shows good clean straddles on salvos 1 through 4, a hit on salvo 5, two hits on salvo 4, and two hits on salvo 5, this within 5 minutes, 15 seconds. Still, the Navy was far from satisfied. "The large pattern obtained and the difficulty in making hits with the 14-inch, 45 caliber gun even with good fire control are sources of discouragement," noted Lt. D.P. Moon, Nevada's gunnery officer. "While at the navy yard turret roller paths were carefully checked and compensators set. Since leaving the navy yard checks at sea have repeatedly been made with all turrets within two minutes of each other in elevation. . . . All the evidence points to the erratic performance of the guns themselves in producing large patterns." Admiral Robinson, Commander in Chief of the Battle Fleet, concurred, writing "The patterns in both range and deflection were excessive. The causes of the excessive patterns obtained should be thoroughly investigated by the Nevada." "The main battery performance," he wrote, "is not considered good. . . . the causes of getting off alter being on [on] the first salvo, were due to either very poor rate keeping, gun laying errors or poor director pointing or a combination of the three. The range finding up to the fifth salvo appears to have been good. The spotting was exceptionally good." 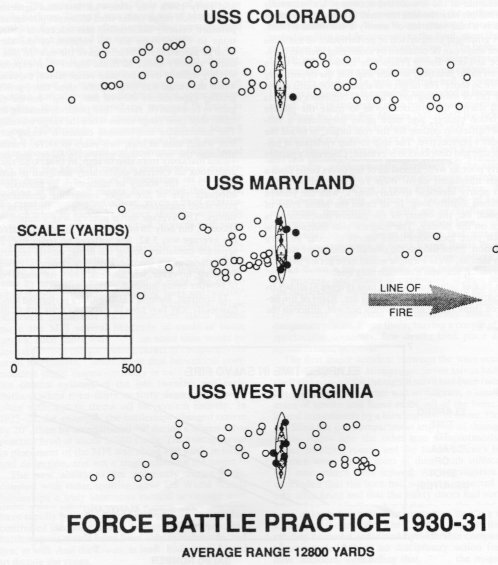 Force Battle Practice (a variation of Long Range Battle Practice) for the 1930-31 gunnery year was specifically designed to test the battle line in engaging a numerically inferior force at close range, to test the efficiency of dye-loaded projectiles in concentration fire, to study the effect of torpedo fire on an engaged battle line, and to exercise casualty procedures in battle. Although this was a short range reduced charge practice for most ships in the fleet, the mean gun range being 12,833 yards, New York fired full charges at 12,700 yards, so this was a high-velocity practice for her. The plan was to have the eight ships in the line fire in double concentration on four battle targets during the beginning of the practice, shifting targets part way through the shoot to put two targets in triple concentration, and leaving the other two under fire from single ships. The changeover did not go well; although New York correctly switched targets at the appropriate time, both California and Idaho bungled the swap, so that instead of ending up firing at her own target, New York found herself sharing a single hapless target with two of her offending sisters in triple concentration.20 The officer in charge of simulating casualties cut off New York's plane spots alter the second salvo, and disconnected the main-battery telephone circuits alter the fifth. Mechanically, the main battery worked flawlessly, with the gunnery officer noting "All ammunition (70 rounds) was expended and there were no casualties except those constructively imposed." As before, the normal battle target has been replaced by the outline of a 785 foot, 20 knot target. The signal to shift targets came at 1 minute 55 seconds into the firing, but fire was not shifted until after the fourth salvo. Clearly, the change imposed little difficulty, as hits were obtained on the first salvo fired on target number 3. The loss of communications imposed alter salvo five obviously had a much greater effect, opening the pattern significantly, although hits were still obtained. The recovery from the large error associated with salvo 1 is remarkable, and in fact New York would probably have actually hit on salvo 2, fired 1 minute and 50 seconds into the practice. After that, she would have obtained two hits on each of salvos 3, 4, and 5, and one hit on salvo 6, this within 7 minutes and 13 seconds. The Long Range Battle Practice for 1939-40 had the usual objectives of training main battery personnel and spotters. To provide maximum training for control parties and spotters, the Director of Fleet Training made partial salvos mandatory, to be fired by forward and alter groups (each of which had their own spotting and control parties) in succession.23 This was a low velocity, i.e., 2,000 foot per second, practice, fired at an average gun range of 19,121 yards. By now, the use of delay coils was standard operating procedure. The weather conditions were, in the words of Commander Battleship Division Two, ". . . a fine example of one of the more unfavorable combinations of wind, sea, light, and visibility." Wind and sea were moderate, but ships were firing into a bad sun glare [and a] surface haze about 200 feet deep which caused a mirage effect on the horizon. "24 Under these conditions both Tennessee and Maryland found that the usually more dependable stereo range finders were less accurate than coincidence types.25 A change of 30° from approach to the deployment course was made by simultaneous ship turns at "Commence Firing," and another turn of 30° away was made during the shift from the forward to alter groups between salvos 7 and 8. Casualties were few; although Tennessee's written report listed no material casualties, her Sheet 4 for the practice noted that the left gun of Turret I misfired on both salvo 1 and salvo 2. The target is assumed as a 785 foot ship traveling at 20 knots. Neither of the turns, totaling 60°, seems to have had any significant effect on Tennessee's accuracy. Deflection performance was excellent throughout, with all salvos crossing the target. Note how neatly her spotters found the range during salvos 1 through 4, and how the plotting team for the alter group was able to keep the salvos "just over" during salvos 9 through 14. In response to a series of "down" spots from salvo 10, plot brought the pattern "down 100" between salvos 11 and 12 to get a restraddle and ensure that the patterns were not excessively over. The resultant hitting on salvos 13 and 14 was exceptionally good. Tennessee's patterns were extremely tight, especially when compared to those shown in earlier practices; nine gun salvos would have been about 1.18 times as big. Against a real ship target, she would probably have achieved her first hits on salvo four, 3 minutes, 42 seconds into the practice, hitting consistently thereafter and getting sixteen hits in the first fourteen salvos, a very creditable performance. Again, note that this was the average performance for the fleet, and that other ships did considerably better. The previous examples are typical of individual ships but do not compare relative performances directly. Examination of other Long Range Battle Practices enables us to analyze the differences in performance between nominally identical ships as well. The table below, for example, taken from LRBP for 1932-33, can be used to compare the relative performance of Colorado, Maryland, and West Virginia, all equipped with eight 16-inch guns in four twin turrets. Note the large variation in the average error of MPI, a measure of the fire control accuracy. Unfortunately the sample size remains too small to determine whether this is a real variation or merely a statistical artifact. A graphical comparison of performance of the same three ships can be obtained by examining their performance at Force Battle Practice in 1930-31. This was a seven salvo practice, so each ship had the opportunity to fire 56 shots. The target was about 12,800 yards away. The fall of shot diagram, shown below, combines all shots fired during the practice so as to make the pattern variation clearer, and once again substitutes a 785-foot battleship outline for the real target, in to aid the reader's perspective. The ship-to-ship variation in pattern size and distribution is evident; Colorado's pattern is long and stringy with a noticeable "hole" near the Mean Point of Impact dividing the pattern into a collection of overs and shorts; she deserved better luck. In contrast, Maryland's pattern is short and rather wide, indicative of poorly aligned turrets. Spotting was relatively poor as well; almost all of her overs come from a single misplaced salvo. West Virginia exhibits a pattern nearly identical to Maryland's, with the pattern bunched slightly long. In all cases the Mean Point of Impact, i.e., the center of the pattern distribution, is right on the money. The diagram also indicates how much pure luck sometimes seems to enter gunnery equation. Even though the overall patterns are reasonably similar, West Virginia would have gotten five hits, Maryland, six, and Colorado only one. A plot of salvo numbers vs. time allows us to compare their relative rates of fire. Rates of fire between ships varied about twenty percent, although the straight lines indicate that the rate for each individual ship remained relatively constant. The new ability to fire accurately during turns, coupled with radar spotting, gave US World War II battleships a truly enormous tactical advantage over the majority of their potential enemies. Most enemy ships which maneuvered to avoid incoming fire would have been unable to maintain effective return fire, while those which chose to keep to a steady course would have rapidly been smothered by highly accurate radar-controlled incoming salvos. In contrast, the American battlewagons would have been able to maneuver, and fire, at will. And the Iowas, at least, had enough speed to dictate the range. Some exercises tested the reliability of the systems rather than the accuracy of the guns. The achronistic Short Range Battle Practice for example, in which the battleships blasted away at targets only a couple of thousand yards away typically getting eighty or ninety percent hits, was fired every year until the outbreak of the Second World War. It was retained because it tested loading and firing crews to the limit, even though the range was almost ridiculously low.33 The objects of SRBP were to test and train gun pointer groups at pointer fire, to test and train loading crews at maximum safe rates of fire to test material, and to stimulate interest in gunnery. It certainly succeeded in increasing speed. In 1919 battleship main batteries averaged about 1.9 Shots Per Gun Per Minute [SPGPM]. By 1930 the average rate had risen to about 2.5 SPGPM, though for a variety of reasons it never got much higher than this. In fact, the obsession with speed in Short Range Battle Practice finally became so great that in 1938, CNO, fearing that some ships were not checking for bore clear with sufficient care, promulgated regulations specifying a minimum twenty-four second loading interval, and imposing a penalty if it was not upheld.34 Navy "E"s in gunnery, predominantly displayed on the sides of turrets between the wars, were primarily awarded for performance in Short Range Battle Practice. Aside from being a fertile source for the study of loading accidents, the results of SRBP are of relatively little historical value, and will not be studied here. The secondary battery of most battleships operating between the wars typically comprised two batteries, about a dozen high velocity, low trajectory 5"/51 guns, used to defend against surface targets, coupled with about eight 5"/25 caliber guns, designed to be used against aircraft. By the middle of World War II, most of these old guns had been removed and replaced by a single battery of 5"/38 caliber dual purpose twin mounts which Treaty and Post-Treaty battleships got right from the start. Although some battleships experimented with rapid continuous fire, with each crew firing as fast as it could load, this made spotting difficult and the general procedure was attempt to fire full salvos, synchronizing the various gun crews by means of buzzers. "Missing a buzzer" was considered a capital offense, as the crew would then have to wait for the next buzzer in order to shoot. Although the number of Hits Per Gun Per Minute continued to increase year by year, few officers were satisfied with secondary battery performance.41 In 1922, Lt. Cdr. F.J. Cromerford aboard Nevada would characterize the battery as ". . . decidedly inefficient." "In most cases the salvos are very well bunched," he wrote, ". . . but the patterns are not placed right, so hits are few. The service of the gun is [usually] excellent, the director and operators and pointers are on, and the rate of fire is good, so the trouble must be in the control. "42 Although the battery could be very effective against a single ship, stopping a group of destroyers approaching in formation would be much more difficult. A single 30 knot destroyer, for example, could close from c. 16,000 yards to 10,000 yards (reasonable torpedo range) in about 7 minutes. Assuming six guns could engage, 0.35 hits per gun per minute - the fleet average - would yield fourteen hits, more than enough to disable it. Distributing the same fire among a half dozen destroyers in formation, which would require firing a barrage, would be much less effective. Assuming a barrage to be 30% as efficient as aimed fire, and dividing the total number of hits equally amongst six incoming ships would yield less than one hit per ship. True, the concentrated fire of four or five battleships might improve the situation somewhat, but not as much as one might think. Coordinating and spotting small caliber concentration fire was difficult at best, and would be, in most cases, well-nigh impossible. C.T. Joy, in a 1929 lecture "Some Notes on 5-Inch, 51 Caliber Gunnery" gave some reasons why secondary battery fire control was so poor. These included a lesser number of men assigned to the task (13 as opposed to 60 for main battery), lack of experience, outdated equipment, the small size of 5-inch splashes (which made spotting difficult), and the relatively high rate of fire (7-10 seconds between salvos as opposed to 30-50 seconds for main battery shoots).43 Fortunately, between 4,000 and 11,000 yards, the new 5"/38 caliber gun, which was mounted on the pre-treaty battleships only after Pearl Harbor, was significantly better than the 5"/51 caliber gun it replaced. But it was primarily used against aircraft. The change from a mixed battery of 5"/51 and 5"/25 guns to a single group of 5"/38s greatly simplified the fire control problem. For the first time, the battleships could fire their secondary batteries in true director control. Previous control of the 5"/51s had been, by comparison, relatively rudimentary. Fully enclosed gunhouses meant that internal lighting could be enhanced, which greatly improved efficiency, especially at night. The newer gun was much more effective under 12,000 yards and at least equally effective outside that range. The high-velocity low-trajectory 5"/51 was ballistically the superior weapon against surface targets and the increase in effectiveness was obviously due to better fire control. Further, the 5"/38, having been introduced into the fleet some years earlier in destroyers, had been more or less completely de-bugged before it reached the battleships.44 And it was remarkably accurate. Unlike the main batteries, which employed delay coils to delay the center gun about 0.060 seconds, the 5"/38 twin mount fired both guns simultaneously. BuOrd found that installing delay coils decreased the 2-gun range pattern from 100 yards to 92 yards at 11,700 yards but, because firing one gun after the other rotated the mount, this was accompanied by an equivalent increase in the deflection pattern. 10 round patterns, representing a battleship broadside, tended to average about 175 yards at 10,000 yards and 335 yards at 12,000. By way of comparison, the six-gun secondary battery pattern size for West Virginia was 643 yards at 14,212 in 1925; 329 yards at 10,258 in 1929. Controlling director out for two to five salvo interval. Searchlight train and elevation indicators out for 20-30 seconds. Star shell (illumination) gun out of action. All battle telephones out for one to four salvos. Controlling spotter out of commission for remainder of practice. Any other casualty which will require a shift of control. A division of battleships, operating as a detached wing, is proceeding at moderate speed during the night to rejoin own forces at daylight. Detachment is very lightly screened. Enemy surface forces are known to be in the area. A screening vessel encounters three enemy battleships on reverse heading and discloses their presence to the detached wing commander who takes them under fire with main battery. Shortly alter the main batteries open fire, enemy destroyers making an attack on the unengaged side are disclosed by another screening vessel, and secondary batteries take them under fire." Target courses and speeds were determined by successive rolls of a die. Night Battle Practices imposed their own artificialities, of course. Illumination of the towing ship, for example, was often necessary to prevent collisions or confusion with the target. If unlighted, tugs would shine a search light vertically, and wave it wildly in order to call off any dangerous incoming fire. In 1930-31, a typical year, the battleships fired Night Battle Practice B, for broadside guns. The practice - clearly anticipating Savo - was deliberately designed to determine what ammunition, if any, should be preloaded in the secondary battery in order to meet an unexpected night attack. The atmosphere was very clear, and the visibility was excellent. The mean range to target was about 5,000 yards, slightly lower than average.50 It was expected that ships might get their first effective shots off within 30 seconds, but no ship attained this standard. Because of this failure - 44 seconds being the average time to first effective salvo - further practices were scheduled to determine whether or not it might be better to turn on searchlights while the first salvos of starshells were still in flight. The average salvo interval was about 10 seconds, but performance among the various ships in the battle line varied markedly; Colorado's six-gun average interval of 5.9 seconds was lowest, while tardy Tennessee took almost twice that long. Everybody got some shots on target, although the hit percentage was rather unpredictable, ranging from Texas' 6.6% to California's 40.5%. Some problems recurred in both daylight and darkness. In the 1930-31 practice, for example, Tennessee placed the starshell gun under control of director No.3, and the rest of the battery under control of director No.1. In the confusion of the exercise, the two directors locked onto different targets, which pretty much ruined her performance and undoubtedly generated a good deal of colorful language from her crew. Such confusion was hardly uncommon, and even in daylight practices it seems that at least one ship in every exercise made the mistake of placing her directors on one target while her rangefinders futilely tracked another. Similar problems are still encountered today. Some of the most important gunnery exercises were fired against aircraft. Inter-war US battleships used both 5"/25 caliber and 3"/50 caliber guns for anti-aircraft defense. Only the first of these will be discussed here, and (due to the limitations of space) exercises with smaller caliber guns will be neglected entirely. Analyzing the results of Anti-Aircraft Battle Practices is extremely difficult. Unlike main battery weapons, which remained relatively unchanged, the make-up of a given ship's secondary battery and the type of aircraft conducting the exercise often varied markedly over time, making any clear determination of progress difficult. About the best that can be done is to describe typical results from various periods, and leave any interpretation to the reader. Early anti-aircraft exercises were fired against kites towed by destroyers or tugs. The speed of the target was thus relatively low, even in comparison with the relatively stodgy aircraft performance of the day. Even then maximum ship speed was rarely used; towing ships were actually cautioned against towing too quickly, as this might bring the kite line nearly vertical and place the target directly above. Sometimes tethered or free-floating helium (meteorological) balloons were used although the board appointed to review the use of these targets in 1921 cogently noted that they ". . . make good targets, but do not simulate a bombing plane. "51 Gliders were considered but rejected, as the Navy had no effective means of getting them up in the air, controlling them in the air, and recovering them afterwards. The Army Air Corps provided sleeve targets for antiaircraft practices beginning in 1921. 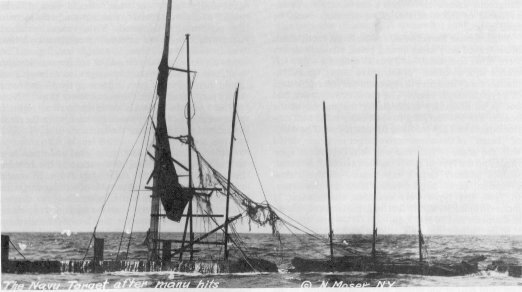 A seaplane towed the first sleeves, 16 feet long and 42 inches in diameter, at the end of a 4,000 foot towline. The results were gratifying, with the review board concluding that a red sleeve four feet in diameter and 10 feet 6 inches long, at the end of a 7,000 foot line ". . . in the absence of an actual plane to fire at (provides] the best type of target possible. . ."52 Much later, drones were used, especially to train against dive-bombing attacks, which could be safely simulated in no other way. In a representative exercise, Mississippi, Nevada, and Pennsylvania fired at sleeve targets in 1922, expending 875 rounds in total. Pennsylvania fired 401 rounds in four runs at a sleeve target (apparently towed by an F5L seaplane flying at about 80 knots) at about 5,000 foot altitude. The course of the sleeve was essentially over the firing ship, as the intent was to simulate a horizontal bombing attack. On run number two, which was typical, 122 rounds were fired in 2 minutes and 5 seconds from 5 guns. Two guns suffered casualties to the recoil cylinders, firing 26 and 28 rounds respectively. One gun, firing 23 rounds, noted several misfires, complaining that "ammunition is very poor," and another fired only 12 rounds, as the pointer could not locate the target. The remaining gun fired steadily with no interruptions, expending 33 rounds. Nobody hit the sleeve. By 1932-33, at least five methods of antiaircraft control had been developed, direct fire, 1 minute barrage, fixed zone, creeping zone, and creeping barrage. All methods assumed that the target was on a collision course with the firing ship, which implied that concentration fire, which would be virtually impossible to spot in any case, was out of the question.53 The battleline fired three practices that year. Each ship fired Battle Antiaircraft Practice B (for Bombing) twice and Battle Antiaircraft Practice T (for Torpedo) once. Sleeve targets were used for the B practices, towed at about 80 knots, at an average altitude of about 6,300 feet. Once again, as horizontal bombing was being simulated, the course of the sleeve took it nearly over the firing ship. Firing was discontinued once the attacking aircraft - or more precisely, the attacking sleeve - had passed the bomb release point. Runs on the T practice were similar, although the sleeve was towed at low altitude, and the target track was across the bow rather than more-or-less directly across the beam. The results, the observers noted, did not compare favorably with the previous year's performance. Although the overall hit percentage remained constant at 20.3%, the percentage of sleeves hit had dropped from 92% in 1931-32 to only 79% the following year. Curiously, the problem turned out to be due to a sandstorm, with observers noting that the atmosphere during Practice B, which took place off San Pedro, ". . . contained sufficient particles of sand to introduce serious errors in the rangefinding." The best overall performance was turned in by Maryland, which achieved 38+ hits out of 80 rounds fired. The worst performances were turned in by Tennessee and Arizona, which expended 105 rounds and 152 rounds respectively without hitting a thing. The ships averaged 13.35 Shots Per Gun Per Minute. Twenty-four radio controlled drones, converted from N2C-2 and 03U type aircraft were available in 1940. Although many were expended in non-battleship practices, Pennsylvania, Maryland, New Mexico and Mississippi each got a crack at one, and New Mexico shot hers down.55 It was obvious that aircraft capabilities had changed dramatically; target altitudes had been increased from roughly 7,000 to 18,000 feet and further extensions above 20,000 feet were expected. The old 80 knot sleeve targets were gone; directors capable of handling "target presentment" speeds in excess of 200 knots were recognized as both necessary and desirable. Pre-war estimates of the effectiveness of anti-aircraft gunnery varied dramatically, depending upon who was doing the assessment. One report expected ships equipped with 5-inch batteries to be able, at ranges under 20,000 yards and at altitudes less than 20,000 feet, to break up formation bombing and drive off a high percentage of attacking aircraft. Another commented that "In about 25 percent of the antiaircraft target practices fired against targets simulating attacking horizontal bombers, at an average range of 5,500 yards, the firing vessel [a category including all types] has been able to open tire with sufficient accuracy to place the opening bursts in such a relative position that the target was within the normal pattern in fuze range, elevation and deflection." In contrast, in 1940, the Director of Fleet Training noted dismally that ". . . the probability of shooting down a single modern horizontal bomber at a range of 5,500 yards as it advances to the attack on a ship mounting a four-gun, 5-inch battery is 2 in 100 chances." The radius of destruction of a single burst, he noted, was not much in excess of five yards, so given four bursts in a 350 yard fuze pattern it was not hard to understand why so few drones were shot down even when the fire control appeared to be perfect.56 Theoretically, even flawless fire control should achieve only about 1% hits. American officers watching European developments noted that contemporary British practice of covering all avenues of approach with a 36-gun density seemed to work well against the Germans, but concluded that success of a similar fire density against the Japanese would have to await the outbreak of actual hostilities.57 American equipment was consistent but unreliable; a study of two identical directors tracking the same target noting that ". . . present antiaircraft fire control equipment is precise, but not necessarily accurate. On a single target presentation, it has been found that solutions obtained by independent control parties will agree closely as to course, speed, and altitude of target, but the solution obtained may not necessarily be a hitting solution." The results of Pennsylvania's 1940 drone firings seemed to confirm the Director of Fleet Training's pessimism. She fired on two drones without hitting either.58 And if hitting a single drone was difficult, European experience had confirmed that engaging actual aircraft, which would probably approach in formation, would probably be even harder. Air groups which chose to split up, for example, would cause great confusion, as the directors and rangefinders often couldn't agree on which target was which. Granted, enemy bombers would have to straighten out on their final approach, but unlike drones real planes had a nasty habit of changing their speed during the final run to throw off any previously defined solution. One bright spot was the British finding that near misses could often scare enemy bombers away, or at least spoil their aim. Drones, by comparison, were essentially fearless. It is rarely remembered that the original arrangement of most ships in the battle-line included a number of underwater torpedo tubes. Until the tubes were removed in the twenties and thirties the battleships routinely fired battle torpedo practices along with the destroyers and the submarines. The results were never very encouraging. Considering the gunnery power of the battle line, the range of most of the torpedoes was almost ridiculously low, and aiming, except in a very general sense, was obviously out of the question.63 The mechanical difficulties in launching a torpedo crosswise underwater at 21 knots - at least prior to World War II - proved to be overwhelming. The percentage of hits was computed on a statistical basis, based on the assumption that the enemy ships, steaming in line, covered a fixed portion of the horizon. In 1922-23, a typical year, the fourteen ships of the battle line fired a total of 116 torpedoes, of which no less than 32 failed to run properly. Two torpedoes ran circular - suggesting that in action the whole exercise might actually have been more dangerous to friend than to foe - while fourteen others either ran "cold" or failed to reach the specified range. One from North Dakota ended up striking the towing ship. The last battleship torpedo practices were fired in 1930-31. Maryland, Tennessee, Colorado, West Virginia, California and Idaho each fired six Mk VIII-3 or Mk VIII-3B torpedoes, three to port and three to starboard, at ranges approaching 11,000 yards. Only West Virginia was able to get all her "fish" across the target line, achieving two full and three "partial" hits.64 Unlucky Idaho had five erratic runs, and lost one torpedo entirely, placing last. Maryland, with four full hits, one partial hit, and one "cold shot," placed first. Each man in her torpedo crew received a $10.00 bonus. This equation would seem to yield a performance of about 0.165 Hits Per Gun Per Minute (HPGPM) at the average range of the practices.65 A graph of this equation compared with actual firings from the twenties and later is reproduced below in Graph 1. Top: Graph 2 - HPGPM for 14-inch and 16-inch guns. Bottom: Graph 3 - True Mean Dispersion. While the HPGPM illustration gives a clear snapshot of performance at given dates it is not capable of illustrating any evolutionary trends.67 For any particular year, the heavy dot represents the average performance of ships in the fleet, while the thinner vertical lines extending above and below represent the range between the best and worst performances fired.68 Graph 3 above plots True Mean Dispersion, a measure of the inherent accuracy of the guns. The rather regular "sawtooth" pattern of the average performance line is a function of the type of firing that was done. Low velocity practices, usually fired every alternate year at reduced ranges, had inherently lower dispersion than high velocity practices, where ships fired full charges much farther away.69 The decrease in dispersion taking place about 1934 is evidently due to the introduction of delay coils, which cut the mean dispersion almost in half. The trend is quite well expressed from about 1927 on, and exhibits what might be described as a "classic" evolutionary pattern, comprising a more-or-less steady improvement in average performance coupled with a decrease in the spread of the extreme performances. Gunnery was getting better and more consistent at a relatively constant rate. 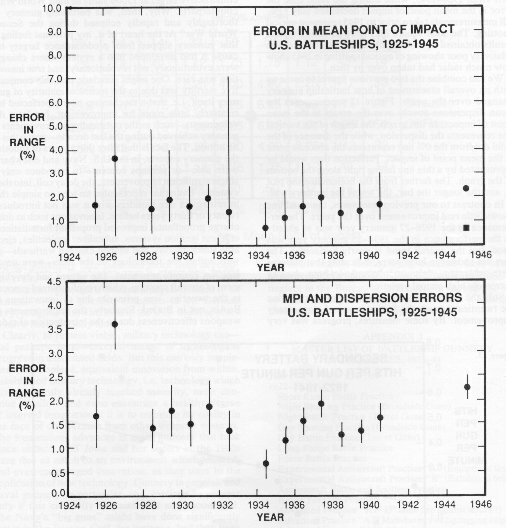 Graph 4 below shows the error in the Mean Point of Impact (MPI) over time, i.e., how far center of the average salvo pattern was from the center of the target, is also expressed as a percentage of range. This is a measure of how well the guns were aimed, i.e., of the quality of fleet fire control. As before, average errors, expressed as percent of range, are shown with solid dots, with the thinner lines representing spread between the best and worst ships in the fleet. The trend line (not shown) is indicative of a slow but steady improvement over time. Taken in combination, the graphs seem to show that improving the quality of the guns was easier than improving their aim; the mean dispersion in 1945 dropped 66% from 1920-1945, while during the same time the error in the mean point of impact decreased only 23%. All measurements taken prior to 1945 represent optical spotting. The solid square in the first graph below shows typical results obtained by radar spotting during the war. The relatively poor showing of optical spotting in 1945 show how much radar had taken over by then. We can combine the two previous figures to come up with an overall assessment of how battleship gunnery changed over the years. Graph 5 below superimposes the mean dispersions evenly over the errors in the mean point of impact. In this graph, the length of the vertical line represents the dispersion, while the distance of the solid dot from the 0% line represents the absolute error in the mean point of impact. Perfection thus would be represented by a thin line falling right along the bottom of the graph. The farther from the bottom line the plot is, and the longer the bar, the worse the gunnery was. Top: Graph 4 - Error in MPI. Bottom: Graph 5 - MPI and Dispersion Errors. In contrast to our previous measures, the trend line shows little real improvement over the years. The performance in the 1926-27 gunnery year was as ghastly as the performance in the 1934-35 gunnery year was good, but the overall trend is nearly horizontal. The bars are shorter in later years, indicating that patterns were tightening - delay coils helped a lot here - but the overall error in the Mean Point of Impact is nearly constant over time. The best shooting was done in gunnery year 1934-35. A similar plot of HPGPM for secondary batteries over time shows a slow, steady improvement but it should be noted that there was an extremely high annual variation. . As ranges for secondary battery LRBP tended to be constant at about 10,000 yards, a graph gives a reasonable picture of performance variation over time. Still, the overall picture of battleship gunnery during the twenties through the forties is one of slow steady improvement. By some measures, progress was very real; as Figure 8 illustrates, World War II gunners might have expected 3.5 times as many hits on a battleship constructive target at 15,000 yards as their World War I counterparts. Why, then, was battleship gunnery so thoroughly and rapidly eclipsed during the Second World War? At the heart of it, my personal feeling is that gunnery slipped from predominance largely because it had developed into a system where changes were evolutionary, not revolutionary, and true innovation was rare. One might conclude that this comparative sterility was due to the technical maturity of gunnery itself, i.e., that a mechanism nearly perfected left relatively little room for improvement, but later developments - such as the outstanding improvements in gunnery achieved during the last decade - prove this to be untrue. The fact is that after thirty years of shooting the gunnery experts, in the U.S. Navy and elsewhere, were able - or perhaps content - to introduce only a single significant improvement, the delay coil, into their systems. Even that represented an idea so simple that in retrospect one wonders why it was not introduced twenty or thirty years before. Innovations such as dual-charge propellants, improved propellant formulations, efficient ignition systems, subcaliber projectiles, ejectable submunitions, and shaped-charged warheads - all well within the technology of the time - were never tested, and rarely, if ever, considered. Instead, BuOrd restricted its innovations to trivial adjustments in projectile weight, tube length, and charge weight. It was an environment - in fairness somewhat politically governed by treaty - where a modification allowing gun tubes to elevate to thirty, and later forty-five degrees, was considered a major advance. Throughout the period of interest, significant improvements in gunnery represented the adaptation of technology that essentially came from elsewhere. This was not entirely beneficial. The advent and development of aircraft spotting, which revolutionized gunnery in the twenties, was primarily due to innovations in BuAir, not in BuOrd. Similarly, the improvements in weapons effectiveness due to the introduction of radar and the proximity fuze stemmed more from developments in electronics than from stunning advances in ordnance. The development of fire control equipment, while requiring a good deal of input to define the problem, primarily reapplied off-the-shelf optical, electronic and mechanical items in unusual combinations. Within BuOrd itself, research and development was essentially neglected - systematic tests to determine the laws controlling the penetration of armor which might have led to the introduction of more effective projectiles, for example, were rare. Fortunately for the U.S. Navy, this creative sterility seems not to have been confined to America. Although a detailed analysis remains to be written, with the possible exception of the German navy, progress elsewhere, as in the U.S. itself, appears to have been glacially slow. Surely, the decline of gunnery that was associated with the transition to aircraft and missiles was to a large extent inevitable. Guided flying machines have inherent strengths (and weaknesses) that are unique unto themselves. But so do guns. In reality, gunnery failed to maintain its supremacy because it neglected to seek out and apply the aggressive creativity that would have helped it to maintain its edge in spite of advances in alternative weapons. In short, gunnery lost the vision to succeed. Instead of leading, it went on the technological defensive. Paradoxically, this sad transition took place during the height of its supremacy, and those minds containing the fertile seeds of innovation that were crucial to its continued success either died of neglect in the Bureau of Ordnance, or moved into the cockpit, leaving the turrets behind. There is a danger that the same thing may happen again. ^A notable exception is Allan Zimm's "Battle Stations" simulations, based upon official US Navy Maneuver and Fire Rules, themselves derived from actual tests. ^The utmost outspoken commentary, incidentally, seems to have been delivered by aviators and those in submarines; by comparison the battleship personnel were positively conservative. A rather typical example of a battleship complaint was submitted by Lt. (j.g.) D.D. Scott of USS Mississippi in 1935-36, who wrote, "The errors in the [Battle Antiaircraft Practice] run may be partially attributable to rangefinder errors due to interference from flue gases. This caused erratic rangekeeping performance from a rate control standpoint since the range-finder operator frequently changed his readings, leading the rangekeeper operator to the erroneous conclusion that his Set up was greatly in error." "During drills on board the Mississippi," he continued, "it has been necessary for the entire director personnel to abandon either director at various times because of flue gases suffocating personnel." The problem was apparently never fixed. ^FTP 36 (Reports on Gunnery Exercises 1922-1923) pp 170 et seq. ^The commanding officers of the five top scoring destroyers in gunnery year 1922-23, for example, when future admirals would have been "cutting their teeth" as Lt. Commanders or Commanders, were, S.F. Helm, in Pruitt, R.M. Hinkley in Mervine, W.H. Lee (not W.A. Lee) in J.D. Edwards, J.0. Hoffman, in Mullany, and H.J. Abbot/W.L. Ainsworth in Marcus. Of these, only Hinckley and Ainsworth rate an index entry in Morison; Rear Admiral Ainsworth commanded cruiser and destroyer forces off Guadalcanal; Commander Hinckley is listed as commanding destroyer-minelayer Butler off Okinawa. The five low men on the 40 ship totem pole were H.B. Mecleary/N.R. Van der Veer in Stewart, M.F. Draemel/C.W. Crosse in Selfridge, G.J. Rowcliff/J.C. Byrnes, Jr. in Childs, J.S. Abbott in Peary, and J.B. Glennon in Sands. Draemel, by then a Rear Admiral, was type commander of destroyers during the Pearl Harbor attack, so flag rank appears to have been accessible from both ends of the spectrum. There were, of course, notable exceptions such as Arleigh Burke, whose crew aboard USS Mugford obtained 36 hits out of 36 shots at Short-Range Battle Practice in 1939-40, but Burke would probably have made it anyway. The whole issue is a fruitful area for further research. ^In 1934-35, for example, each member of the first place cruiser turret crew received a prize of $15.00. By comparison, the average American family lived on about $1,350.00 per year and a New York hotel room cost about $4.50 a night. ^The use of a towed target train sometimes posed laughable difficulties. In one case a large caliber projectile cut the towline early in the exercise and the target train slowed rapidly to a stop. The result was complete confusion in the battle line. Some ships took no account of the problem at all, their salvos continuing a majestic march into completely empty ocean (some suspected that this was because they were actually tracking the towing ship instead). Other ships adjusted their fire to remain on the slowing target train, but got hopelessly confused as the targets closed up on each other and began to overlap. The net result was utter chaos, followed by a lengthy argument about exactly how the practice should be scored. Clearly, disrupting an enemy battle line could cause as many problems as it solved. ^Later, the offset system was changed so that prisms were not required. Instead, the guns themselves were offset about 70 mils from the director line of fire, equating to a 2,000 yard offset at normal battle ranges. One advantage of the older optical system was that it permitted ship to ship "duels," which must have been much more interesting (and realistic) than shooting at target sleds. ^For a battleship, the width of the constructive target was 690 feet at 8,000 yards, shrinking to 210 feet at 34,000. Technically, the width of the constructive target was taken as being equal to the danger space (itself dependent upon the mean target height) plus the virtual beam, plus a small allowance for damage that could be expected from near misses, ricochets and shorts. ^This term, one of a variety of nearly synonymous terms such as "selected level" and "selected cross-level," had been replaced by other terminology by World War II. The names changed often, but the methods remained the same. ^F.T.P.134, Gunnery instruction, 1933 describes the systems then in use in great detail. World War II systems are best described in Navpers 16116, Naval Ordnance and Gunnery, 1944, and/or subsequent editions. ^The first reference I can find of a ship firing in what seems to have been a reasonable approximation to the continuous-aim methods employed during World War II was USS Nevada, which employed the system - apparently experimentally - in 1935. Earlier references to "continuous aim" do exist, but apparently refer to entirely different techniques. Although exact dates are difficult to establish, virtually all main batteries seemed to have been equipped with the necessary Mk XXXII stable verticals by 1935. Although the new system seems to have taken a while to catch on, by 1940, continuous aim was the method of choice. ^The error, though annoying, was not large; guns were typically aligned within 0.5° when new, and guns parallel at 10° elevation might be 0.25° out of line when the elevation reached 30°. This equates to a deflection error of about 12 feet (0.1 mils) at 40,000 yards, which is entirely inconsequential when compared with the normal deflection pattern, which was about 4 mils for a 9 or 10 gun salvo. Viz OPIS "Instructions for the Installation and Tests of Turret Guns and Sights, 1921." ^The advent of delay coils, which staggered the firing times a fraction of a second, somewhat mooted this point, however. ^The problem was by no means trivial; in 1927-28, about 10% of rounds fired fell into the wild-short category, and thus would be useless against an enemy. "Wildovers" were very much rarer, and were generally caused by a gun firing very late on the up-roll, a short duration hang-fire, a faulty firing key, or a shell which had fallen back upon its powder bags, which tended to boost the chamber pressure and increase the initial velocity. Muzzle blast interference, could, of course, be reduced by increasing the inter-barrel separation, but only at the cost of greatly increased turret weight. Delay coils, in contrast, weighed essentially nothing. ^FFP 36 (Reports on Gunnery Exercises 1922-23) pp 167. ^The spotters on the ship were usually right. In 1922 then Lt.Cdr. R.K. Turner of California would write ". . . the technique of using airplanes in the fire control must be further improved. Communication is still unreliable, and it is not certain that the use of aircraft actually improved the shooting, although it would have seemed that this point would be particularly noticeable in hazy weather, such as existed [during the practice]." Obviously, opinions varied widely; that same year, the officers aboard Delaware would note ". . . The use of airplane spotting is undeniably superior in all phases to spotting from the firing ships." FFP 36 (Reports on Gunnery Exercises 1922-23) pp 176. Things work much better when the gunner can actually see the pattern himself, as it is now possible using televised pictures transmitted from a remotely piloted vehicle, or RPV. ^Blue Fire Effect Tables, 16"/45, Department of Operations, U.S. Naval War College, June, 1935. ^The layout has been slightly modified for publication. Although the actual "Sheets 4" for this particular practice appear not to have survived, the statistical analysis indicates that the thirteen ships in the battle line achieved 60 hits for 1,179 shots, or slightly over 5% hits on the main battle raft at a mean range of 27,450 yards. Each ship fired 10 salvos in a mean time of 12 minutes 5 seconds. As the battle raft had an area of about 520 square meters, and planimetric measurements of a variety of World War I and II battleship designs yield a mean area of about 4,500 square meters, this would imply that in triple concentration fire on an actual battleship target, each three-ship group would have scored about 120 hits in 12 minutes, or about 3.33 hits per minute per ship. U.S. Navy doctrine at this time assumed that about 20 penetrating 14-inch hits would sink a battleship, so an actual target would have only survived about two minutes under this concentration of fire. Or so the theory goes. ^The description of Nevada's mechanical failures during this practice is fragmentary and difficult to interpret. Exactly which turret (or turrets) failed during the first salvo is not specified, although the failure was evidently minor, as all turrets continued to fire thereafter. Salvo six was evidently missing the three guns of Turret IV and the left gun of Turret III, whereas salvo 7 evidently fired all guns except those in turret II. The three bag-load attributed to salvo seven should have resulted in a wild short, and the pattern for salvo seven is unremarkable, suggesting that the three bag load took place in turret II, which did not fire. For salvos 1 and 2 the Sheet 4 shows ten guns being fired, but the fall of shot diagram plots only nine splashes. The missing shells may have been wild shorts. ^The reason for Idaho's error is not recorded; in California, the error was due to the gunnery officer, who misinterpreted a signal. Significantly, several suggestions to streamline and improve battleline signalling techniques resulted from this incident. ^In 1940 the standard performance for 14-inch main batteries at 12,700 yards using full charges was about 0.84 HPGPM. In comparison, the 1935 Naval War College Maneuver and Fire rules for the same range expected 0.1333 HPGPM. ^The control zone was an arbitrary defined rectangular area which would catch 50 per cent of shots fired if control were perfect and the dispersion and variation of MPI were equal to standards based on past performance. The exact size of the control zone thus varied from exercise to exercise. ^California and Tennessee then had different firecontrol installations from other ships in the Battle Force, and they were authorized to employ a modified form of selected cross-level fire for both forward and after groups. In the overall summary of battleship exercises, an unknown author, presumably Admiral Stark or Admiral Leary, noted "In view obsolescent fire-control installations of the batteries concerned, performance of Tennessee's main battery [is considered] especially noteworthy. Results attained by these batteries are not to be considered as justifying the retention of older fire-control installations in service, but they do serve to demonstrate that alert, well-trained personnel can exercise effective control of their batteries if installations are properly maintained, and used as they are intended to be used." A self-synchronous (i.e., improved) fire control system was scheduled for installation in Tennessee during fiscal year 1942. ^FTP 203-1 (Reports on Gunnery Exercises 1939-40), pp 63. ^Tennessee used two coincidence type 33 foot Mark XXII range finders and one 15 foot Mark XXXVIII stereo rangefinder during the shoot, noting that "Normally the latter is the ship's best range finder." In fairness, the overshooting-undershooting problem would have only been a problem in true blind fire, where no observation of the fall of shot was possible; in most practical cases, of course, the initial salvos could be brought closer to the target by imposing ACTH (Arbitrary Correction To Hit) and successive patterns could be spotted on to a target visually or by radar. Inherent dispersions, of course, couldn't be corrected that way. The Bureau of Ordnance expected the nine-gun patterns given by the 16-inch batteries mounted aboard the Washingtons, South Dakotas and Iowas to be slightly larger than the eight-gun pattern sizes for the old 16-inch guns mounted aboard Colorado, Maryland and West Virginia. Specifically, eight old guns were expected to yield an average range pattern of 1.8% of range while nine new guns would give a 1.9% pattern. These were ideal figures; in practice the old 16-inch guns gave a seven-gun pattern size of about 2.2% of range during their last firings in 1941. The dispersion of the 16"/45 and 16"/50 guns, incidentally, was essentially identical; ranging sheets at Dahlgren often listed dispersions for the two types interchangeably. Today, the 16"/50 yields a 9-gun pattern size of about 1.5% of range at short ranges, slightly less if the range is long. Viz. Bulletin of Ordnance Information, No.3, 1945, FTP 2101, Reports on Gunnery Exercises 1940-41 and Naval Weapons Laboratory Tech. Report No. K-26167. The current performance of the Iowa class is substantially better than this. 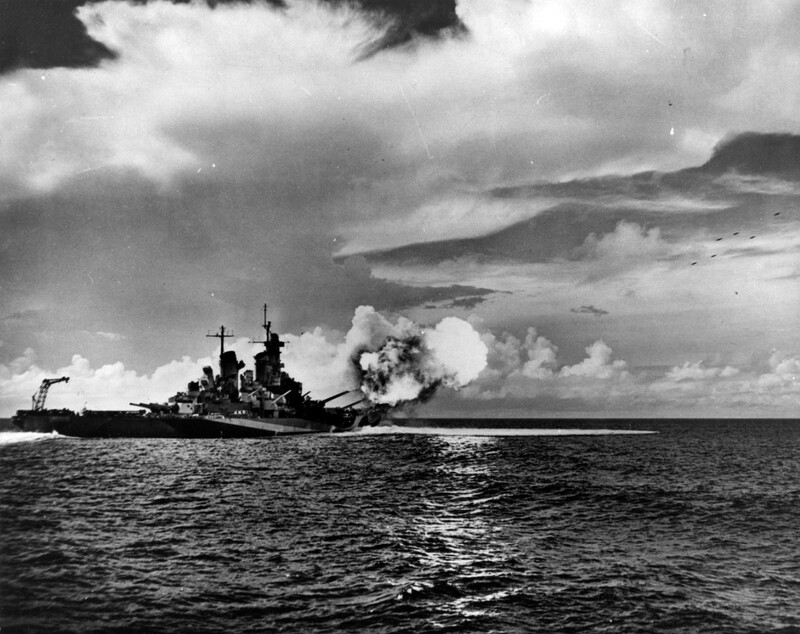 ^BuShips Memo "USS Idaho (BB-42) Main Battery Exhaustion Firing," 21 October 1942. ^USS Indiana, "Casualties to Ordnance Equipment," 28 January, 1945. ^See, for example, USS Alabama "Report of Target Practices fired 9 May to 13 June, 1945," pp 7. ^In poor weather, of course, the effectiveness of both optical and radar spotting could decrease markedly. Older radars could see through rain, but not very well. ^Illustrations from Mk 8 radar scopes reproduced in the Bulletin of Ordnance Information No.3, 1945, show that although individual splashes tended to blend together, the general position and size of the pattern was perfectly clear. If the target was small, however, it was sometimes easy to confuse shell splashes and targets. Comparing the radar screen to a "picture" is, frankly, stretching things a bit. ^F.T.P. 89 (Reports on Gunnery Exercises 1927-1928) pp 60 et. seq. Although the control of fire during turns had improved markedly by the late 1930s, the situation remained far from satisfactory. In 1941, for example, USS California, firing during a 150° countermarch at 23,000 yards - characterized by the Commander of Fleet Training as ". . . a most severe test" - had an average deflection error of 212 yards, but this excluded one wild salvo which landed 4,100 yards left of the target and some 2,100 yards ahead of the towing ship. In the same practice, one of Maryland's salvos landed 1,664 yards left of the target when the trainer in Turret III turned on his ready light when the turret was still 5° out of train, which corresponded to one full turn of the zero reading dial. Salvos fired during turns tended to be "on" in deflection and "off," in range, or vice-versa. Navy observers at the Battle of Samar, who were intently watching incoming heavy caliber fire, noted the same error pattern in Japanese salvos. Viz. F.T.P. 210-2 (Reports on Gunnery Exercises 1940-1941) pp 40 et. seq. ^F.T.P. 191 (Orders for Gunnery Exercises (1940)) specified that: "Except for gunnery school firings, Short Range Practice "A" shall be completed by each battleship prior to firing any other practice prescribed for the gunnery year." FTP 165-2 (Reports on Gunnery Exercises 1936-1937) specified the range for Short Range Battle Practice to be 2,100 yards for 16-inch guns, 1,700 yards for 14-inch, 3 gun turrets, 1,900 yards for 14-inch, 2 gun turrets and 1,600 yards for 12-inch guns. For the secondary - i.e., 5-inch battery, Short Range Battle Practice was 1,900 yards. ^The change, CNO would later write, ". . . resulted in a reduction of about 8 percent in SPGPM of battleship main batteries, but is considered to have promoted smoother loading and to exerted a steadying influence which was in part responsible for a slight increase in percentage of hits" (FTP 185-1 (Reports on Gunnery Exercises, 1938-39) p.1). To show how closely the intervals were being shaved, the Director of Fleet Training suggested that the minimum interval be increased a further two seconds for turrets having all guns in open gun chamber. ^On 28 July, 1936, during a scheduled gunnery school firing using full charges, a 6"/53 gun (Ser.No. 605) exploded aboard the cruiser USS Marblehead. The gun fired perfectly on the first three salvos. As the fourth salvo was being fired, an explosion in the breech killed one man instantly, and seriously injured ten others, two of whom later died. The fault was eventually traced to a faulty reinforcing ring used to repair the gun, which spread and failed under load. BuOrd must have been horribly embarrassed. Turret accidents were usually confined to severed fingers and smashed hands, caused by getting something caught in the gears, and the occasional broken arm or leg, usually caused a fall or by being struck by a recoiling gun. ^Navord OP 10143R Ordnance Safety Precautions pp 77 et. seq. ^Use of these undoubtedly unauthorized containers was admittedly infrequent, at least in the larger ships (the smaller ships, especially the submarines, were apparently much less formal). One of Tennessee's 14-inch turret crews used an undershirt to gather up loose grains in 1925-26; New York's report for 1924-25 mentioned the use of a pillow slip, removed before the loose grains were loaded into the breech. RGE 1924-25 p.277, RGE 1925-1926 p.869. ^A more detailed description of U.S. Navy main battery loading accidents may be found in Warship International No.2 1990. This article describes recent developments surrounding the 1988 turret explosion aboard USS Iowa. ^Abridged Range Tables For U.S. Naval Guns, OP 1188, gives the range of the 5"/51 as 17,000 yards at 19°46' elevation. OP 1184 gives only 16,000 yards at 20°32'. ^Sheets 4 for most secondary battery practices are now lost; this typical firing plan has been reconstructed from descriptions in FTP 191, Orders For Gunnery Exercises, 1940 pp. 2F1 et. seq., and checked against the sheets for the 1939-40 gunnery year, which have survived. ^The values shown are grand unweighted averages for both forward and after groups in both director and pointer fire (local control). 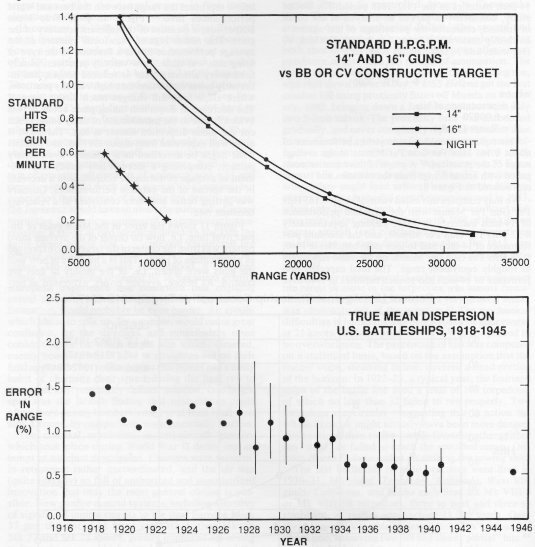 The number of Hits Per Gun Per Minute was computed on the basis of shots in the constructive target, not hits in the much smaller target screen. At 13,000 yards the destroyer constructive target was assumed to be +/- 16 yards in range, and +/-43 yards in deflection. The average range for 1934-35 was about 1.5 times normal, which helps to explain the unusually poor performance that year. ^FTP-36 (Reports on Gunnery Exercises 1922-23) pp 170. ^FTP 108 (Reports on Gunnery Exercises, 1929-1930) pp. 113 et. seq. ^The teething problems with the 5"/38, which has since achieved an almost mythical reputation for accuracy and reliability, seem to have become lost in the fogbanks of history. Commentary in the Reports on Gunnery Exercises series reveals that the "trusty old 5"/38," which jammed constantly at first, was far from a reliable performer when introduced. That, however, is a story for another time. ^If fired at ranges under about 4,000 yards, the remaining velocity of the projectile was high enough to tear the parachute and extinguish the star. ^The comparatively low rate of fire with starshells was at least in part due to the requirement to devote at least part of the battery to keeping lit starshells over the target. FTP 140 (Reports on Gunnery Exercises 1932-33) p. 131 gives details. In 1932 special tests were fired to determine if firing starshells deliberately short had the potential to blind an enemy, too. It didn't work. ^The big problems in using remote searchlights would be in keeping the lights on target when the smaller screening vessel rolled and pitched, and in coordinating the efforts of the firing and illuminating ships. Also, if the illuminating ship were too far away from the firing ship, the relatively narrow searchlight beam would tend to cross the line of fire obliquely, leaving many shorts and overs in darkness. ^One writer would note in the mid-thirties that "The control . . . is thoroughly unsatisfactory, except in smooth water. The mechanical elevating and training gears are stiff and full of lost motion, and the elevating gear is too slow to follow the rolling of a battleship. It is only under exceptionally favorable conditions that the lights can be controlled from a near-by position, and there is no distant control other than that afforded by the connection to the broadside director training system." The searchlight teams used "match-the-pointer" systems to keep the searchlights nearly "on" in train, but as they usually could not see the target, they had great difficulty in aiming the searchlights vertically. Even a 0.5° pointing error would place the beam 250 feet high (or low) at 5,000 yards. A survey of automatically controlled searchlights aboard California in 1922 showed that although elevation errors were usually very small, azimuth errors were commonly in the vicinity of 3°-4°. Keeping the errors below 2° with the Evershed system then employed required constantly checking the system. In 1929 West Virginia complained that the smallest graduation on the searchlight course dials was 2°, equating to a 200 yard error at 6,000 yards. Still, in 1932 the Director of Fleet Training would note that the greatest difficulty in pointing searchlights was in keeping them on the horizon in spite of the roll of the ship. "The four high intensity 3-inch searchlights installed in this vessel . . . are in poor condition and require replacement. . . . The ball races and drums are pitted, the frames on the drums require stiffening, and the drums are not light-tight. The doors on the drums need renewal. Covers on ventilating motors are bent or sprung. Signal shutters are bent and warped. Gears on the lamp mechanism are worn. Insulation is poor on electric cables. Ammeters are damaged. Armatures on blower motors are burnt and should be rewound. Thermostatic control mechanism requires some new parts. The lenses . . . are unsatisfactory and will not stand up to gunfire." FTP 99 (Reports on Gunnery Exercises, 1928-1929), pp 932. ^The range was limited by the maximum time which could be set on the 21 second time fuze of the blunt-point 5-inch/51 caliber illuminating projectile used in the practice. Associated problems with short range firing of starshell, described earlier, meant that this type of projectile was truly effective in only a relatively narrow range band. A long-point illuminating projectile was then under development, which would extend the effective range of illumination out to 7,000 or 8,000 yards. ^Similar targets - affectionately known as "killer tomatoes" - are used by the battleships today, but only as surface targets. ^Early experiments are detailed in FTP 36 (Reports on Gunnery Exercises 1922-1923) p. 202 et. seq. ^In the Direct Method, which became standard during World War II, guns continuously tracked the target. The 1-minute barrage was designed to place a high concentration of fire in a predefined "box" through which the enemy bombers would pass during the last minute prior to releasing their bombs. The Fixed Zone method of predefined a large number of small numbered "zones" around the firing ship, for which correct train, elevation, and fuze settings had been computed prior to firing. The fire control officers then transmitted the number of the zone where the bombers were at any particular time, and the guns fired to the predefined coordinates. The Creeping Zone method was a variation on this theme whereby successive fuze settings were decreased as the target(s) passed through a given zone, thus (to some extent) accounting for the decrease in range. The Creeping Barrage method was simply a 1-Minute barrage which was applied more or less continuously. Similar methods were used in surface fire control as well. For detailed descriptions, see FTP 134, Gunnery Instruction, 1933. ^FTP 140 (Reports on Gunnery Exercises 1932-33) p 245. The average error was about 200 feet in altitude, and only one or two knots in speed, but this masks the fact that due to coincidence the overestimates and underestimates nearly cancel. The average absolute error was almost twice as great. Better spotting should have corrected these initial errors, at least in altitude, almost immediately. ^Expending 54 5-inch rounds in the process. Maryland expended 56 rounds and hit the drone twice. Mississippi expended 96 rounds in two runs. Her drone eventually crashed, but the cause was probably unrelated to firing. Pennsylvania fired 94 rounds in two runs and never hit a thing. ^The quality of ammunition certainly was no help here; observers typically noted somewhere between 20% and 35% "low order" detonations, and between 4% and 20% duds, this with 45 second Mk VIII-3 time fuzes. The average four-gun fuze pattern was about 400 yards in range. ^See FTP 203-1 (Reports on Gunnery Exercises 1939-40) pp 95 et. seq. for more detail. Noting these results, her gunnery officer correctly noted that their "best forte" was some previous knowledge of the probable speed characteristics of the target. The error in course estimation seems large, but poor control of the drone meant that it quite typically (and unpredictably) would wander 10°-15° off the average course. ^The Mark 37 director system, which weighed almost 20 tons (and which could, in any case, engage only a single target at a time), was originally designed to control the fire of groups of guns in surface salvo fire and was not easily adapted to World War II anti-aircraft work where it might have to handle multiple rapidly-maneuvering targets approaching from several directions at once. The limitations of the Mk 37 were acceptable when barrage fire was common, but VT fuzed projectiles were so effective that AA batteries could henceforth be "split" in order to engage several targets simultaneously. This new potential to assign individual guns to individual targets led to the development of new anti-aircraft directors such as the Mark 57, and the (much smaller) Mark 51. For a fine summary of directors introduced during World War II, see Friedman, Naval Weapons of World War II, USNI Press, c. 1984 [Transcriber's Note: John Campbell is the correct author of this book. The author of this article may have meant to refer to Friedman's Naval Radar or US Naval Weapons]. ^See Baldwin, Ralph, The Deadly Fuze - Secret Weapon of World War II, Presidio Press, 1980. ^USS South Dakota, for example, was still expending "old" Mk 18 mechanical time fuzes in anti-aircraft target practices in May and June 1945. The bursts of time fuzed projectiles were useful in pointing out the target to other ships, were likely to frighten or distract enemy pilots and enabled the relatively rapid detection of grossly inaccurate fire control solutions. Even after the war, doctrine suggested that the ratio of time fuzed to proximity fuzed projectiles should normally be about 1:1. ^Baldwin, Ralph, The Deadly Fuze, pp 245. According to Baldwin, an analysis of 278 aircraft shot down by VT fuzed projectiles between October, 1944 and August, 1945 indicated that only 46 of these would have been destroyed if time fuzed projectiles had been employed. Baldwin's 6:1 ratio apparently assumes that 70% of the VT fuzes worked. A 50% failure rate - the Navy's lower limit of acceptability - meant the effectiveness ratio was closer to 4:1. In comparison, mechanical time fuzes such as the Mk 18 typically worked about 90%-95% of the time. Operational considerations re the application of VT fuzes are well summarized in OP1480, VT Fuzes For Projectiles and Spin Stabilized Rockets, 15 May, 1946. ^A mixture of Mark VIII, Mark IX and Mark X torpedoes were fired in 1922. The Mark VIII, the best of the bunch, could only reach 16,000 yards at 36 knots, taking over 13 minutes to arrive. For a five minute run, this meant that the opposing battle-line would have to have been only 5,500 yards abeam, so torpedoes were evidently intended only to finish off cripples that could not shoot back. In 1922, Admiral Jackson, Commander Battleship Squadron Four, confirmed this, noting, "The range of the Mark IX-I torpedo [7,000 yards at 27 knots] is too short to be of great value as an offensive weapon excepting under extraordinary circumstances." The 36 knot, 3,500 yard, Mark X was even worse. ^Exactly what constituted a "partial hit" is unclear; presumably this was a hit which reached the target line, but passed between the target rafts. At 11,000 yards the number of torpedoes which passed under a target raft as opposed to those passing between two rafts must have been entirely a matter of luck, i.e., a function of the size of the rafts and distances between them. For the record, West Virginia's errors were 655 yards left, 475 yards right, 1,062 yards left, 77.5 yards right, and 632 yards left. The error of the sixth torpedo is unrecorded; presumably it missed the target train entirely. ^The equation yields about 11% hits at 13,783 yards, which was the average range at which the exercises were fired. The time to complete the firings is not recorded, but assuming a rate of fire of 1.5 Shots Per Gun Per Minute, this equates to 1.5 x 0.11 = 0.165 Hits Per Gun Per Minute. The 1935 figures for HPGPM are adapted from tables in the 1935 Maneuver and Fire Rules, the 1940 figure for HPGPM from the 1940 Orders For Gunnery Exercises. The graphed line for 16-inch percentage hits for 1940 was also adapted from the 1940 OGE booklet, obtained by dividing standard Shots Per Gun Per Minute (SPGPM) by twice the Hits Per Gun Per Minute in the Control Zone (HPGPMCZ) which should have caught half the shells. The improvement in accuracy, especially at moderate ranges, is dramatic. ^The U.S. Navy never reverted to a smaller caliber after adopting the 16-inch gun. The 14-inchers never shot as accurately as their 16-inch successors, a problem which defied more than twenty years of concentrated effort to cure. Probably, the interior ballistics were wrong. According to Bulletin of Ordnance Information No.2, 1945, pp 29-30, the then-standard nine-gun range pattern for the 14-inch was 2.03% of range as opposed to 1.9% for 16-inch weapons. To convert True Mean Dispersion values to hitting percentages at various ranges, change the True Mean Dispersion as a percentage of range to an absolute value, convert this actual value to a probable error and then use the dispersion rectangle shown below to convert the probable error into a hit percentage given a target of known size. 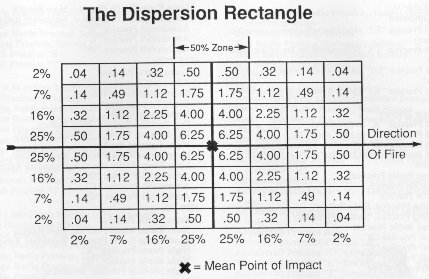 The dispersion rectangle expresses the percentage of shots falling in any given sector of a pattern. The percentages along the edges of the rectangle represent the totals of the respective rows and columns. The mean point of impact is at the center of the diagram and each row and column is one probable error wide. All shots are assumed to fall within +/- four probable errors of the mean point of impact. The diagram shows, for example, that a rectangle adjacent to the mean point of impact one 50% zone long and one 50% zone wide will catch 25% of the shots (6.25 + 6.25 + 6.25 + 6.25 = 25.00). A target one probable error wide and one probable error deep located four probable errors away from the mean point of impact in both range and deflection is at the corner of the diagram, and will catch 0.04% of the shots, a one probable error by one probable error sized target three probable errors behind the point of impact will catch 1.75% of the shots. 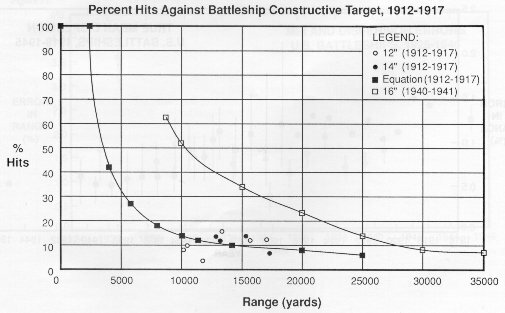 Suppose, for example, that the True Mean Dispersion was 1% of range and it was desired to compute the hit percentage against a battleship sized target at 25,000 yards. Assume that the Mean Point of Impact to be centered on the target, that a pattern is 2 mils wide in deflection, and that the target is 600 feet long and 180 feet wide, including the danger space. The True Mean Dispersion is 1% of 25,000 yards, i.e., 250 yards. The probable error is 0.846 times the danger space, or 212 yards. The 180 foot (60 yard) wide target is 60/212 = 0.283 probable errors deep in range. The deflection pattern is 2 mils wide, i.e., only 25,000 x 0.002 = 50 yards across, so we may assume that all projectiles hit in deflection. Near the mean point of impact (and assuming no misses in deflection), the dispersion rectangle shows that one probable error catches 25% of the shots, so a space 0.283 probable errors wide may be assumed to catch approximately 0.283 x 25 = 7.075 percent of the shots fired. ^Data on best and worst performances prior to c. 1925 are lacking, so the curves in this area are based on very "thin" data. ^Low velocity or reduced charge practices were fired at velocities of about 2,000 f/s; high velocity, full charge practices were fired at velocities of about 2,600 f/s. The trend line of ranges for the high velocity practices is interesting, climbing from c. 21,000 yards in 1921 to about 27,000 yards by the mid-thirties. The decrease in Long Range Battle Practice ranges after that date is interesting too, but all of these were low velocity practices. ^Development of a 13-inch subcaliber round for the Iowa class battleships, which could have been developed into a Copperhead variant, has apparently been discontinued. The article was originally published in Warship International No. 3, 1991, and was transcribed for the internet by Tony DiGiulian. The article is copyrighted 1999 - 2017 by International Naval Research Organization and NavWeaps.com.